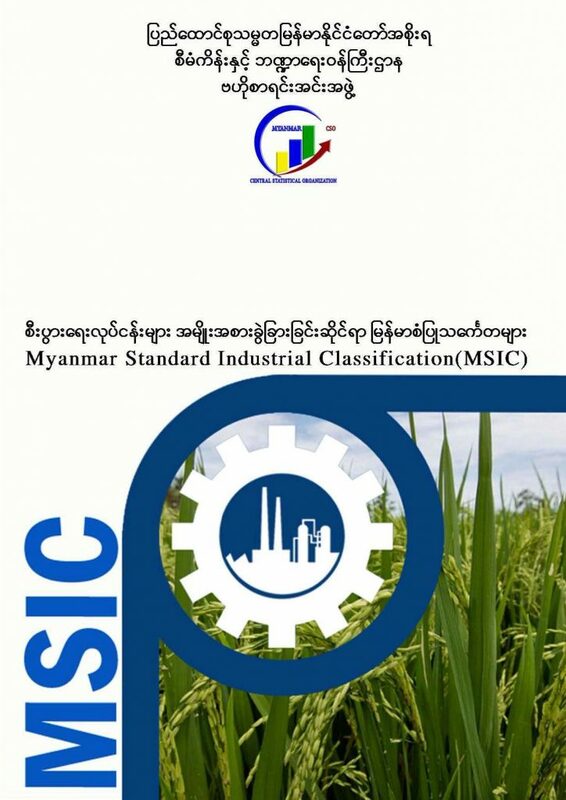 Central Statistical Organization of the Ministry of Planning and Finance has published Myanmar Standard Industrial Classification (MSIC) of all economic sectors in both languages (Myanmar & English) in November 2018. MSIC is developed based on International Standard Industrial Classification (ISIC Revision 4) which explains all Economic Activities identified as a United Nations industry classification system. The main purpose of MSIC is to provide a set of activity categories that can be utilized for the collection and reporting of statistics according to such activities. It provides a comprehensive framework within which economic data can be collected and reported in a format that is designed for purpose of economic analysis, decision-taking and policy-making. The classification structure represents a standard format to organize detailed information about the state of an economy according to economic principles and perceptions. It can help us in facilitating data collection, presentation and analysis at detailed levels of the economy in an internationally comparable, standardized way. It can enhance the internationally accepted standard for categorizing producing units within an economy, which allows for data comparison at the national and international levels. MSIC has 21 sections, 88 divisions, 238 groups, 469 class and 1335 items.